Feature & Follow Friday is a blog hop that is designed to provide some much-appreciated exposure to the bloggers participating, and to expand their following. Hosted by Parajunkee and Alison Can Read, each of whom feature a chosen blog for the week, it's an interesting way to get to know one another. Question of the Week:What is the best book you've read in the last month? What is the worst book you've read in the last month? The best book of the past month would probably be The Scar by Sergey & Marina Dyachenko. Such a pleasant surprise, and such a unique voice in the fantasy genre. The worst book would definitely be Heaven's Shadow by David S. Goyer. Such a brutal disappointment. Parajunkee also hosts a Social Hop for Facebook and Twitter, which I've taken part in the past two weeks. So, if you're one of those people who aren't on Blogger, or who just don't like Google Friend Connect, it's a great way to keep in touch and follow one another. 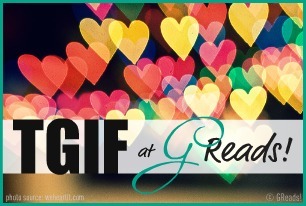 TGIF is another blog hop designed to provide much-appreciated exposure to the bloggers participating, and to expand their following. Hosted by GReads, it's an interesting way to recap the week, pose a question, and find some exposure with a different audience. Question of the Week: Social Networking - do you use Twitter or Facebook to promote your blog? How has it benefited your book blogging experience? If not, how do you promote your blog? Share your twitter handle and/or Facebook link!. I use Twitter, Facebook, and Google+ to promote my blog. Of the three, I seem to get the most benefit out of Google+ (it just works really well for me), although Twitter has probably introduced me to some of the best new connections. As for Facebook, I'll admit that I don't use it as often or as well as I should, mainly because I get so frustrated having to scroll through dozens of game updates, requests for tokens, and other 'crap' just to get to the one post that actually interests me. Cool. ^_^ I'm actually the opposite; I prefer to connect through blogs rather than facebook or twitter. Hopping through. I'm not familiar with either of your books, but it is always so disappointing when a book isn't as good as you expect. It's hard when a book disappoints that much, I've also had a few of those. I haven't heard of either of the books you mentioned, but I'll definitely stay away from the one you disliked. I'm not familiar with either of these books. Books that disappoint tend to put me in a reading funk that's hard to get out of. Haven't heard of those books. What do you tweet regarding you blog. IT's apparently something a lot of bloggers use and I think I need to start. Any advice? Haven't heard of the scar before. Hmm, I haven't heard of either of these books. Check out my Follow Friday! Just hopping by, happy friday! Found your blog through Parajunkie's blog hop and just started following - looking forward to reading more of your posts! New follower! I haven't heard of either of these books, but it's too bad you didn't like one of them. Feel free to check out my F&F here. Hmm, I hadn't really thought of Google +, I'm on it but haven't really sussed it out yet. I like the list functions on FB to help sort the wheat from the chaff. I haven't heard of these books but I will have to check them out. Thanks for stopping by! I'm following you back. Thanks for stopping by. Following back. Hi Bob! Thanks for stopping by the blog. Now returning the favor via Linky. Thanks for the follow, Bob. I returned the favour. I just went to check out the video trailer for The Scar. Looks really good.